The Real Science blog by "Steven Goddard" claims that NASA have altered their data in the USA and other countries to show global warming. Right after the year 2000, NASA and NOAA dramatically altered US climate history, making the past much colder and the present much warmer. The animation [here] shows how NASA cooled 1934 and warmed 1998, to make 1998 the hottest year in US history instead of 1934. This alteration turned a long term cooling trend since 1930 into a warming trend. If so, why would the adjusted data be considered superior to raw data? In a word, no. Weather stations are (as their names suggest) designed for collecting information for weather forecasting (i.e. short term variations in temperature, precipitation etc. ), they were never intended for collecting information for climate research (long term statistical behaviour of the weather). As a result, the instruments used tend to have biases and discontinuities in the records, due to things like moving the station itself, or changing the time of day at which readings are taken, changes of instrument, that are not a problem for weather forecasting, but do pose a problem for climate research. To compensate for these known changes, homogenization steps are taken to correct for these problems. These are well documented and explained in the literature. Blair Trewin, "Exposure, instrumentation, and observing practice effects on land temperature measurements", WIRES Climate Change, volume 1, issue 4, pages 490-506, Apr 21 2010, DOI: 10.1002/wcc.46. The International Surface Temperature Initiative is a useful resource for those interested in investigating this topic in more detail. Also of interest is the Berkeley Earth project, which was in initiative set up by initially skeptical scientists to investigate whether the global surface temperature datasets were in fact biased by these adjustments. Using their own independent method, they found that they got the same results as the other groups. 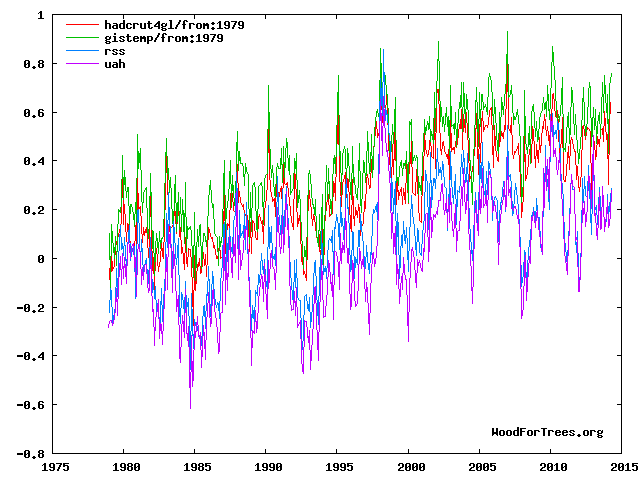 There is also the point that the satellite global temperature datasets give similar warming trends to the surface measurements, but the satellite measurements are not subject to the same biases. Note the UAH product is produced by noted climate skeptics John Christy and Roy Spencer. Essentially, it seems that "RealScience" has just cherry picked the station data to find ones with substantial calibration problems and not mentioned that there are good reasons for these adjustments. Is this refutation of Climate Change scientifically valid?